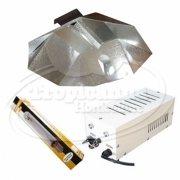 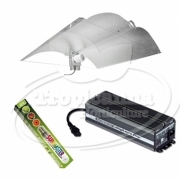 Here we have a selection of some of the different light kits that we offer. 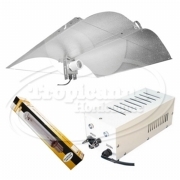 They all vary in price an quality. 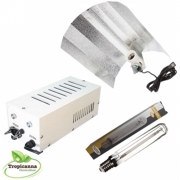 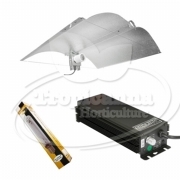 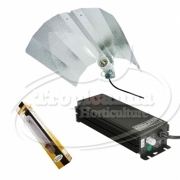 They start at the budget end with kits including metal magnet ballasts and basic but still good reflectors and move up to the premium kits with a range of top quality digital and dimmable ballasts. 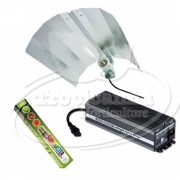 We have chosen our three best selling reflectors, Euro Reflector, Flexi Wing Reflector and the Pro Ultralite Reflector to go with these kits, however if you do not see the reflector that you are looking for and wish to add it to a kit please give our team a ring and we shall do our best to create the light kit of your choose. 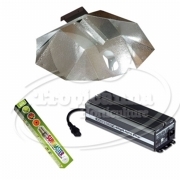 All of our kits give you a choice of changing the bulb to suit you preference and budget.We have the Sunlux Dual Spectrum Bulb, Sunmaster Dual Spectrum Bulb and Osram Son T Plus Bulb. 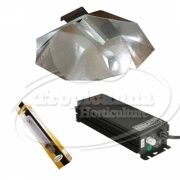 Again if you do not see the bulb you would like please give us a ring and we can arrange this for you.